Can the weirdness of quantum mechanics make you well, or make you wealthy? Presentations ranging from "The Secret" to "What the Bleep Do We Know?" suggest that science allows you to capitalize on quantum possibilities, but theoretical physicist Lawrence Krauss says it's just a load of bleep. Krauss has dealt with factual and fictional weirdness for decades — as the author of "The Physics of Star Trek," as the head of Arizona State University's Origins Project, and as the author of a "Quantum Man," a soon-to-be-published biography of pioneering physicist Richard Feynman. "I begin the book with a quote from Feynman that says, 'Reality takes precedence over public relations, for nature cannot be fooled,'" he told me. "I think the point is that Feynman realized that people can be fooled, but nature can't." Krauss worries that a lot of people can be fooled by appeals to the admittedly weird world of quantum physics — a world in which particles are said to take every possible path from point A to point B, in which the position and velocity of particles are necessarily cloaked in uncertainty, in which the mere act of observation changes the thing being observed. Cosmic Log: Every once in a while, you'll hear about something like "The Secret," or some other reference to quantum mechanics as explaining how you can change your universe, or even perhaps why it's in the realm of possibility that a globe-gobbling black hole could be created — because "anything can happen" in quantum mechanics. But I assume that's not quite right, and that sometimes quantum mechanics' name is taken in vain. Lawrence Krauss: I think it's probably one of the most abused concepts in physics among the public. You should be wary whenever you hear something like, "Quantum mechanics connects you with the universe" ... or "quantum mechanics unifies you with everything else." You can begin to be skeptical that the speaker is somehow trying to use quantum mechanics to argue fundamentally that you can change the world by thinking about it. Q: But isn't everything really connected? Doesn't the quantum world pervade everything that we see around us? A: Of course it does. So does classical physics. The quantum world does pervade everything around us, but as Richard Feynman liked to say, "Scientific creativity is imagination in a straitjacket." Not everything is possible. That's what makes the world so interesting. It is true that quantum mechanics is extremely strange, and on extremely small scales for short times, all sorts of weird things happen. And in fact we can make weird quantum phenomena happen. But what quantum mechanics doesn't change about the universe is, if you want to change things, you still have to do something. You can't change the world by thinking about it. We are connected to the world by many things: by light and sound and heat. We do, at subatomic scale, behave quantum mechanically. But we behave like classical objects for a reason: We're big, we have lots of particles, they interact. All the weirdness of quantum mechanics gets washed out on the scale that we can experience. That's why we experience a classical world. The weirdness of quantum mechanics is reserved for either very specially prepared configurations in the laboratory, or scales that are so small that quantum-mechanical effects are significant. We're also connected to the universe by gravity, and we're connected to the planets by gravity. But that doesn't mean that astrology is true. With quantum mechanics, there's a notion that observers affect the things that they're observing. That's not always true, but it's often true. That's one of the very strange properties of quantum mechanics. Therefore people get the notion that there's no objective reality, and that you can literally impact on the external world just by doing things internally. That's not the case. If you want to affect something in the external world, you have to do something to it. You can't just hope for the best. You can't bring good things to you by thinking about them. The quantum mechanical correlations, the spooky action at a distance that quantum mechanics brings up, is true only for very specially prepared systems that are isolated from the rest of the world, completely. And we are certainly not isolated from the rest of the world. We're bombarded by many things every second of the day, and a result, we're not specially prepared quantum mechanical systems, nor can we exert weird quantum powers over other objects. Q: Some scientists, such as Sir Roger Penrose, have talked about neurons as quantum systems. And a lot of people talk about quantum consciousness ... that even if the everyday world we see is not a system that can be changed, our consciousness about the world can be changed. A: Well, Roger Penrose has given lots of new-age crackpots ammunition by suggesting that at some fundamental scale, quantum mechanics might be relevant for consciousness. When you hear the term "quantum consciousness," you should be suspicious. The reason you should be suspicious is because we don't even understand classical consciousness. 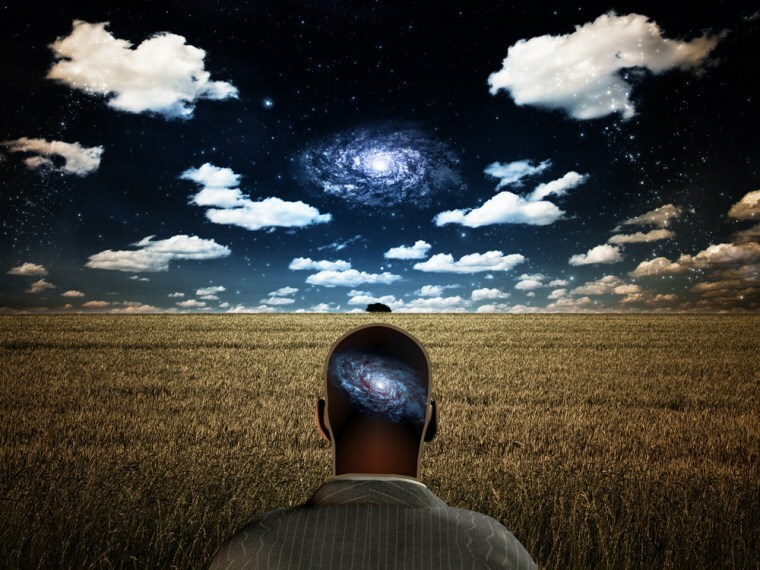 If we don't understand classical consciousness, how can we understand quantum consciousness? Many people are dubious that Penrose's suggestions are reasonable, because the brain is not an isolated quantum-mechanical system. To some extent it could be, because memories and thoughts are stored at the molecular level, and at a molecular level quantum mechanics is significant. Quantum mechanics may play a role at some level in the way the brain works ... just as it may play a role in photosynthesis. But that still doesn't mean that, at a global level, the weirdness of quantum mechanics is manifest. It's certainly not. If it were manifest, you could run at a wall a lot of times, and every now and then you'd spontaneously appear on the other side of the wall. Q: You do see that in some science-fiction shows — for example, last season on "Fringe." And quantum mechanics is often used as the explanation for that. A: Quantum mechanics is often quoted as the explanation for many things, because it's so weird that people latch onto it as a hope, to explain everything that they would like to believe about the universe. Everything from the possibility of disappearing and reappearing, to the possibility of having strange new forms of communication. We'd like to be able to influence things just by thinking about them, we'd like to transport ourselves elsewhere without getting on an airplane. All those things can be attributed to quantum mechanics — first of all, because it's so poorly understood by the public, and especially because it's so verifiably weird. It's used as an excuse to be even weirder. I think of what Niels Bohr said to Wolfgang Pauli about theories that are "not crazy enough to be true." Quantum mechanics is crazy, but it's just crazy enough to make the world still be sensible at a macroscopic level, the level that we experience. It's truly amazing that you can separate two elementary particles that were originally tied together, and often make a measurement of one particle that instantly affects the other, even if it's on Alpha Centauri. That sounds like magic. There are lots of things in quantum mechanics that sound like magic. But sounding like magic and being magic are two different things. Q: Obviously, quantum mechanics has lots of real-life applications, including in your television set and your microwave oven. But are there new, weird applications that people might see that have an impact on everyday life, beyond the woo-woo? A: Absolutely. One has already been recognized: If we do carefully prepare quantum systems, and keep them isolated, we can perform quantum magic technologically — potentially on scales that we haven't been able to do before. We might be able to create quantum computers, for example, that will simultaneously do many different calculations at once, because the quantum world is capable of doing many things at the same time. We may be able to use quantum communication in ways that we haven't done before. The debate here is that we'll be able to use quantum mechanics to break codes, in particular to determine the big prime numbers that are at the basis of the security of your credit cards and your bank cards. Right now they use a key that's based on the products of large prime numbers, and no computer could determine the prime factors in a time shorter than the age of the universe. But quantum-mechanical computers might be able to, and then of course we'd have to start thinking about how to make things more secure. The flip side of that is that you can use quantum mechanics, again in specially prepared systems, to communicate in a way that will allow us to know when someone is eavesdropping. So on one hand you have a threat to security, and on the other you have a possible boon for security. We don't know which way it's going to go. One other area where quantum mechanics works on a macroscopic scale is in superconductivity and superfluidity. Those are two places where the quantum world leaks into the classical world. We're not using either superconductivity or superfluidity yet on the scale that I think people thought we might. But we're certainly using them at the Large Hadron Collider, which we couldn't even operate if we didn't have superconducting magnets. A: Well, yeah, the point is that there have been these new-age desires for lots of things to make the world better: crystals, energy vortices. ... People latch onto their dreams, and they always try to match them to reality. Quantum mechanics is a replacement for the phrase "anything goes." Once anything goes, you can have anything you want. So what better thing to have than something that gives you everything you want? The point is, with quantum mechanics, everything doesn't go. On certain scales, for certain times, in certain regions, everything goes and strange things happen. But it's not true for the universe at large. Often, people who are trying to sell whatever it is they're trying to sell try to justify it on the basis of science. Everyone knows quantum mechanics is weird, so why not use that to justify it? ... I don't know how many times I've heard people say, "Oh, I love quantum mechanics because I'm really into meditation, or I love the spiritual benefits that it brings me." But quantum mechanics, for better or worse, doesn't bring any more spiritual benefits than gravity does. Is the grand design within our grasp? Join the Cosmic Log corps by signing up as my Facebook friend or hooking up on Twitter. And if you really want to be friendly, ask me about "The Case forPluto."